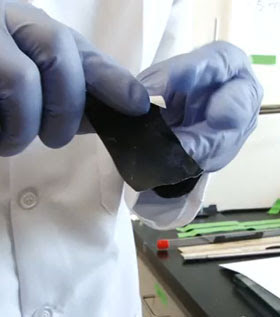 amk: Wearable Power – Paper Battery..
Assistant professor of materials science and engineering at Stanford Yi Cui and his team have manufactured a new energy storage device (battery) out of ordinary paper or cloth coated with carbon nanotube ink. Sounds fantastic news for wearable power especially as this process can be made cheaply and efficiently manufactured into lightweight paper or textile batteries and supercapacitors which act like batteries to store energy but by electrostatic rather than chemical means like in conventional batteries. The paper supercapacitor could offer up to 40,000 charge-discharge cycles compared to around 500 cycles of todays lithium-ion batteries. Mr. Cui’s invention of a ‘magical power powder’ applied to textiles could transform an inner-liner of a jacket into a wearable battery, a foldable, stretchable power source for the devices we have in our pockets (or bags). Wearable power, one of the hottest research areas today might still be a futuristic dream but each new research release comes a step closer to the technical and manufacturing feasibility. Mr. Cui demonstrates in the video below how easy and simple his invention can transform ordinary paper into an electrical energy storing device. This type of paper/cloth battery would be a perfect candidate for eTexile application.